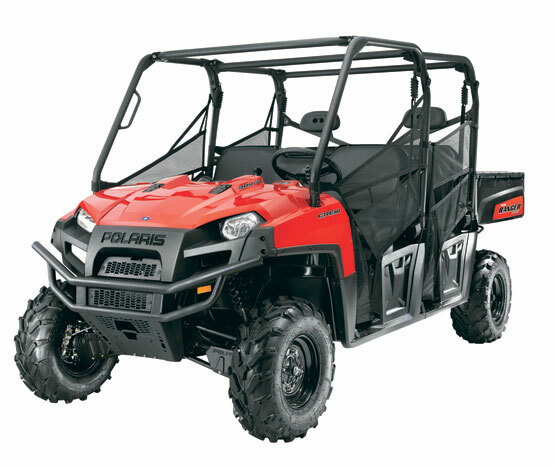 The 2011 Polaris RANGER CREW® 800 is built with unmatched traction and seating for six. It’s the ultimate multi-passenger side-by-side. The only four-corner adjustable suspension system. Dual A-Arm with exclusive top mounting-point adjustability. Adjust to softer setting for recreational riding or stiffer for heavy-duty work. Front: 9.6″ suspension travel. Rear: 9″ of Independent Rear Suspension. Cab ergonomics deliver outstanding driver and passenger comfort, with easy cab slide-through design for six adults to get in and out quickly. Proven 800 Twin EFI engine with 40 hp has more than enough power to move six people and their gear. Electronic Fuel Injection (EFI) ensures fast, reliable starting in any temperature, plus automatic adjustments for altitude.